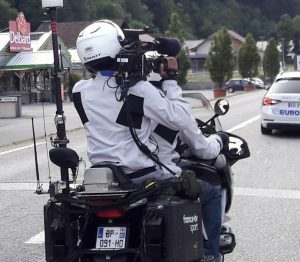 Digital Vidéo Sud (DVS – a Euro Media subsidiary) has continued its tradition of innovation at the Tour de France with the utilisation this year of an ‘on motorcycle’ SuperloupeRF camera. The newest onboard camera position was the result of four years’ development work by DVS. Superloupe cameras were already in evidence at the Tour de France, with two devices placed on the finish line and capable of recording up to 1000 second images according to the needs of production and ASO. The deployment of the new device – dubbed the Superloupe RF Moto – was previously tested at the 2018 editions of Paris Roubaix and Dauphiné Libéré. It delivers live slow-motion footage (up to 300 fps) from bike 4 located near the front of the racers. The result, says DVS, is that Tour de France viewers will be able to enjoy key sights along the route in unprecedented detail. Also worthy of note is the fact that the motorcyclists riding bike 4 can adjust the camera using a dedicated application which can be controlled directly with their smartphones.